Established in 1997, the kennel facility features fourteen roomy indoor/outdoor runs, opening to a large exercise paddock. 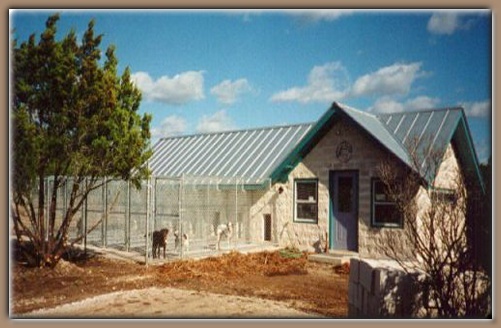 The kennel is fully air-conditioned and heated for the comfort and safety of your best friend. All boarders are required to show proof of vaccinations including rabies, DHPP and Bordatella [kennel cough]. These vaccinations are essential in maintaining the health of your dog and safe-guarding the well being of other guests. After the initial puppy series of vaccines and one adult booster, we accept according to the latest TVMA core vaccine recommendation for 3 year boosters for Rabies and Distemper/Parvo. Bordatella must be administered within the last 12 months. ALL DROP-OFFS AND PICK-UPS ARE BY APPOINTMENT ONLY!! Check out time is 1:00 PM. Pick-ups after that time will be charged for the night. Please call in advance for a reservation and approximate drop-off time. Van service is available from the PetSmart parking lot near Lakeline Mall on Thursday mornings at 7:15. Please schedule service in advance! There is a $12.50 family charge for the service.